On top of an air conditioner unit that was improperly installed, bad attic ventilation might also be causing mold issues. Lennar has never inspected the ventilation. It’s been determined that the A/C unit was not properly installed. You can see gaps in places you shouldn’t see gaps. Notice the gaps to the right in a couple of places. The tape on the left side was to fix a gap that existed in the A/C unit at the time of construction. The A/C unit has gone out well over a dozen times in 4.5 years. Notice the collection of moisture and mold in the next picture. You can see it in the picture above, but it’s more noticeable below. The A/C unit in these pictures is installed in the attic of the main house. These were taken in the summer of 2014 and just over a year after buying a new construction home at the Westshore Yacht Club. You can only imagine the condition of this unit and the attic now. It’s now been 4.5 years and this has been an exhausting battle. A combination of an improperly installed A/C as well as bad attic ventilation likely explains the mold issues. The builder has numerous cases of mold and A/C issues, including issues with attic ventilation. After this Lennar inspection, I was ill for some time. After reading the report, it’s clear there is a lot of moisture. The report indicates the insulation has been soaked. In Florida, that means it also has mold. The insulation comes down constantly from an improperly installed attic chase. When the attic is open, the insulation literally pours down. Moisture and water damage. No condensation drain trap installed. Lennar A/C inspection report indicating water and moisture damage. The air handler drain pan is holding water. There were signs of water stains around the motor within the air handler cabinet. The condensation line does not have a trap installed in the 3/4″ PVC pipe used to drain the system. Carrier recommends installing a trap at the air handler. Without proper trapping, air is pulled back into the equipment and can allow the water from the condensate pan into the system. This can cause moisture to spread to the liner material and many of the components within the air handler. You might recall, this A/C unit caused a flood and water damage over two years ago. My neighbors recently had a flood that caused $30K in damage. The cause was determined to be an improperly installed and defective air handler. The Lennar inspection report for the main house A/C. We were unable to inspect the supply ducts due to accessibility to all parts of the attic. The return duct system has dedicated return air grills in the hallway, the guest bedrooms, and the master bedroom. The return duct system is in good condition. The supply air duct system has visible signs of leakage around connections. The duct system was not sweating during our visit; however there are signs of sweating around the duct connections. To verify the severity of the leaks and weather [sic] the duct system is in need of sealing or replacing a pressure test would need to be performed. There was already one instance in which the A/C airbox needed a repair due to improper installation by the builder. The air handler was not sweating during our visit as the outside air temperature was 56 degrees; however there are signs of sweating on the exterior of the air handler panels. We recommend Lennar Consult [sic] with a Roofing Expert [sic] for further evaluation of the roof to determine the origin of water stains. 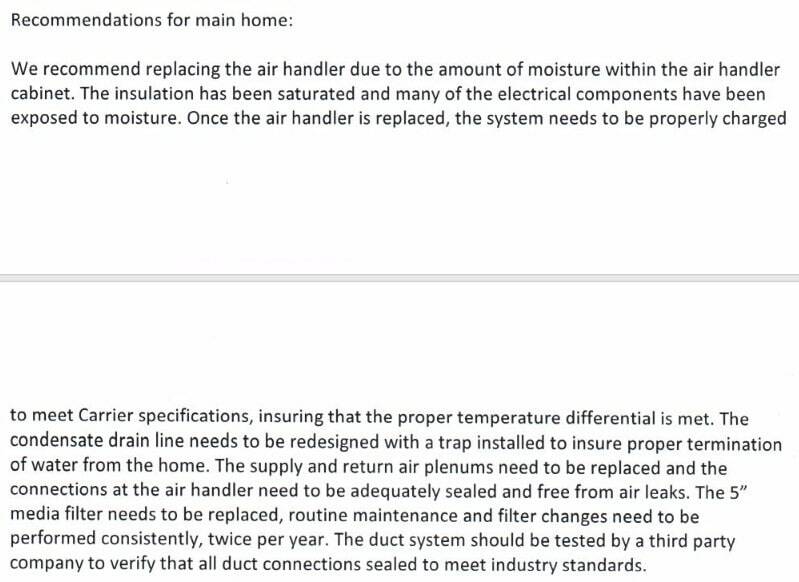 Lennar has already indicated that the extensive leaking that has occurred is almost definitely due to the air handler. Here is a video of that happening. Initially thought to be a roof leak, everything points to A/C condensation and overflow from the drip pan; however, extensive roof inspections have not been conducted. There was a very brief and mostly visual roof inspection done by Lennar in March. Insulation saturated from the water. A/C system should be replaced. Lennar A/C inspection report recommends system replacement. The insulation has been saturated with water as well. We recommend replacing the air handler due to the amount of misture within the air handler cabinet. The insulation has been saturated and many of the electrical components have been exposed to moisture. Once the air handler is replaced, the system needs to be properly charged to meet Carrier specification, insuring that the proper temperature differential is met. The condensation drain line needs to be redesigned with a trap installed to insure proper termination of the water from the home. 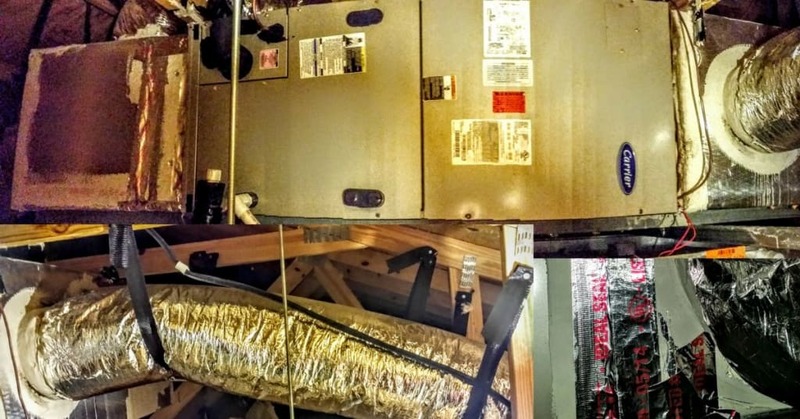 The supply and return air plenums need to be replaced and the connections at the air handler need to be adequately sealed and free from air leaks. The 5″ media filter needs to be replaced, routing mainenance and filter changes need to be performed consistenly, twice per year. 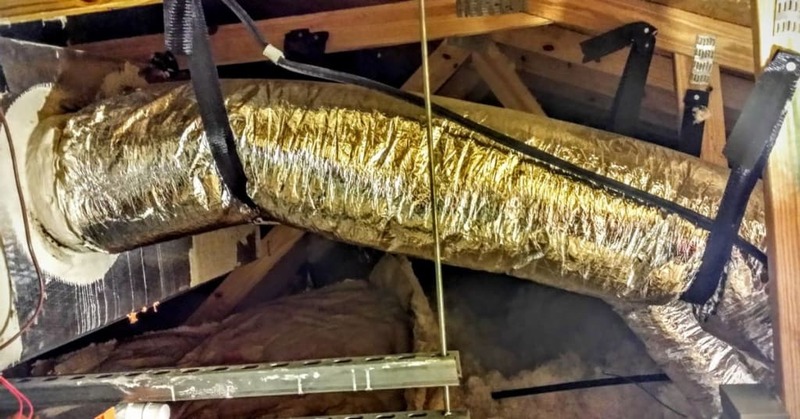 The duct system should be tested by a third party company to verify that all duct connections sealed to meet industry standards. Note: As of the date of this publication, all the Lennar executives went silent and none of the construction repairs were ever made, including the promised replacements of two, improperly installed and defective A/C units causing extensive mold exposure and health issues. Here is the history on this issue that’s gone on for years. Here’s the summary of all of construction issues I keep in a spreadsheet. *Note: For simplicity, the Lennar and WCI Communities names here are used interchangeably as Lennar took over WCI in February of 2017. Ventilation could not be inspected because of access. It is suspected that ventilation is either being blocked by insulation and/or is not adequate judging by the rapid build-up mold on the exterior of the A/C handler. No action. Baffles are installed at the soffit to ensure that insulation does not block the ventilation. Unacceptable response. There has been a build-up of mold on the exterior of the A/C handler. Regardless of the cause, this issue needs to be explored and repaired. Additionally, Mr. Fannin witnessed and recorded a drip coming from somewhere within the ceiling most likely near the air handler of the home. This is a new issue that needs to be inspected and repaired. Resolved by new response – WCI agreed that it will verify the HVAC unit and plenum were sealed in the closet ceiling. Mr. Fannin accepts WCI’s response while reserving his rights. WCI offered to resolve this item but the Homeowner canceled the repair. Note: This is not true at all. See: WCI (Now Lennar Homes) Lied in Their Legal Response. Why? Replacement of air handler in main home. Redesign condensate drain line with a trap installed. Replace supply and return air plenums. Seal connections at the air handler. Replace 5” media filter. My note: This still does not address the possibility of ventilation exasperating mold issues in the attic. I’ve asked since the beginning that when repairs be done that they are done comprehensively and remedy the core issues rather than fixing symptoms. That’s the only way any repair will remain sustainable. Update: Lennar agreed to replace both defective A/C units, but since went silent yet again. The replacements never happened. Kris Fannin is a management consultant, leadership coach, entrepreneur, trainer and national speaker. He has lived at the WCI by Lennar Westshore Yacht Club neighborhood since 2013. The construction issues in his Lennar home began almost on day one and total nearly $300,000. Lennar senior executives went silent in the summer of 2017 and ignored all warranty claims. In 2013 I closed on a new construction Lennar home (formerly WCI Communities). It’s been nothing short of a nightmare. These articles document my experiences and ongoing construction issues with the Lennar Homes builder, the Westshore Yacht Club neighborhood, and my communications with agencies asking for help. As you will read, all the people that should have prevented this – or should have helped when it happened – have done little to nothing. Lennar never made the promised repairs. If you have had similar experiences with Lennar Homes, someone who has, or know anyone who can help, I’d love to hear from you. You can go to the About and Contact to submit a message. My main goal in this website is to get this message out as nobody should have to experience it. I wouldn’t wish this on even the people who are responsible. So one last ask of you is to keep these messages going by talking about it and sharing on social media. P.S. Here is some background information on my Lennar home and experiences if you are just reading the website for the first time. The property address is 6111 Yeats Manor Drive in Tampa, FL. The opinions and experiences expressed here are those of Kris Fannin unless otherwise noted. This site is not affiliated in any way with Lennar Homes, Lennar Corporation subsidiaries, or any business partner of Lennar. WCI Communities and Lennar Homes (and all variants of those names) are often used interchangeably throughout this website. Lennar finalized the buyout of WCI Communities in February 2017. WCI Communities remains the ‘luxury brand’ subsidiary of Lennar Corporation. Note: The total estimated cost to repair all the Lennar construction defects is nearly $300,000, which includes extensive mold remediation throughout the new construction home. Although the builder acknowledged the construction issues, the senior executives I was working with eventually went silent and ignored all Lennar home warranty requests and repairs. None of the repairs have been made by Lennar. © 2019 My Lennar Home. All Rights Reserved.